We spent the first couple of weeks of January doing our best to be real vegetarians. We don't eat that much meat anyway and we were... ok at it. I think we'll do it again this summer when we have greens coming out our ears from our CSA in June or in September when all I want to eat is tomato sandwiches, but in January it's a bit of a challenge (so kudos to Andrew and Cara who made it the entire month!) Particularly when everyone around you is eating hot dogs and you LOVE hot dogs but you eat a veggie burger instead. Le sigh. There are lots of people who will happily get into the politics and morals of why you should or shouldn't eat meat, and for us it wasn't 100% an ethical thing, though our reasons were many: quality, ethically raised meat is expensive. It's not great for the planet. It's easy to eat too many calories if you're eating meat. In general, vegetables are lower in fat and higher in fiber. We are back to eating meat a couple of times a week, but we haven't set up strict guidelines. If you're not already, have you ever "gone veg" for a week or a month at a time? How'd you do? What surprised you? I cooked out of Vegetarian Cooking for Everyone a lot (those curried parsnips were a standout, as well as a mushroom pot pie that I really need to tell you about) and then we bought this weird green cauliflower. It must have been a hybrid brocco-flower type thing, because the florets weren't quite as compact as white cauliflower. I ignored the weirdness and adapted a pasta recipe from Gourmet, just in time for February's Gourmet Unbound. In the original, you are supposed to steam the florets but it was cold in my kitchen and I wanted to turn on the oven and roasted vegetable is almost always tastier than steamed vegetable... so I roasted it. 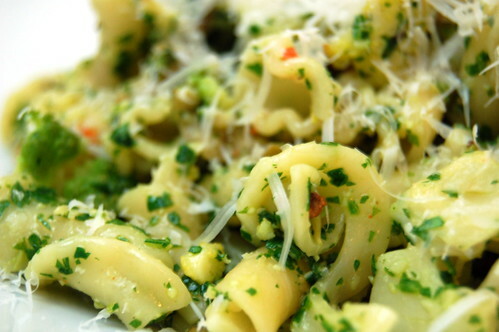 I took a look at the parsley sauce and said, oh, that's basically a pesto without nuts and garlic. Since I had pine nuts and garlic, I incorporated those. And because raw garlic is often too sharp for my taste and I already had the oven on, I roasted a few cloves with the cauliflower before whizzing them into the sauce. Top the plate with a little snowstorm of parmesan cheese, or skip it if you're vegan. Heat the oven to 375 while you chop the cauliflower into florets. Toss florets and unpeeled garlic cloves with a couple of tablespoons of olive oil, a teaspoon or so of salt, and a bit of pepper. 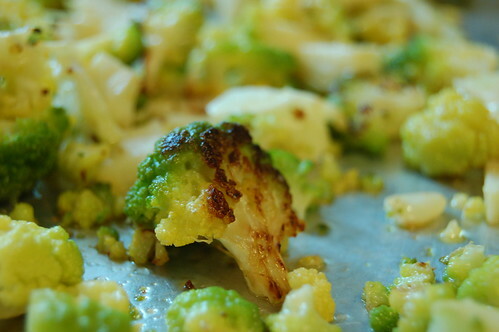 Spread on a sheet pan (one with sides) and roast, stirring once or twice for 20-25 minutes until cauliflower is tender with some brown spots. While the cauliflower roasts, wash the parsley and separate the leaves from the stems. (You can stick the stems in a freezer bag and freeze them for making stock later, if you're into that sort of thing.) Toast the pine nuts in a dry skillet over medium heat, tossing frequently and taking them off the heat and out of the pan just when you start to smell them. Do not turn your back on pine nuts, because they go from toasty to charred in a matter of seconds and charred is burnt and burnt is bad. Grab the garlic cloves (use tongs) from the roasting pan in the oven after about 20 minutes, leave the cauliflower in for 5 more minutes if it's not done. 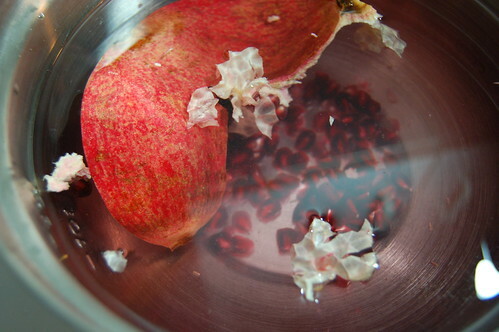 Remove the skins, the cloves should be soft and squishy, if not entirely spreadable. Meanwhile, bring a large pot of salted water to a boil for the pasta. Start the pasta going when the cauliflower has about 10 minutes left, and cook just to al dente, then drain. Save a cup or so of the pasta-cooking water in case you need it to thin out the pesto. 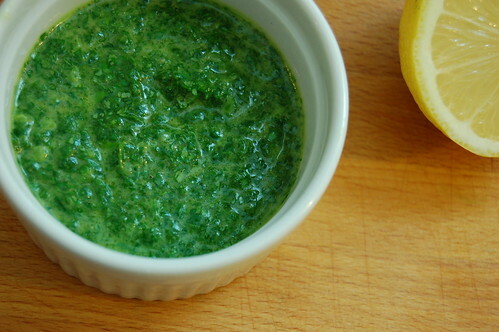 For the parsley pesto, in a blender or food processor (or the tiny attachment to the stick blender, which is my new favorite kitchen toy), puree the parsley leaves, roasted garlic cloves, toasted pine nuts, 1/2 teaspoon of salt, 1/4 teaspoon pepper and 1/2 cup of olive oil. Stop and scrape the sides, and if necessary add another glug of olive oil. Process again, until you have a pesto-like sauce. 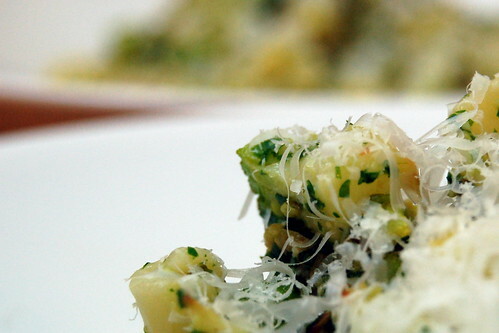 To serve, toss pasta with parsley pesto, cauliflower and olives, top with parmesan cheese. Wow, I really went ahead and fell off the face of the planet there, didn't I? Whooops! It's almost like I had some sort of enormous thing happen that has left me distracted and perusing a whole new world of blogs this week. Maybe it's just me but when we got engaged I immediately thought, ah, I must now imbue every moment with elegance and dignity! I'm engaged to be married! It's a big deal! And now I can use italics and plan a big party! But then... just because a fantastic and romantic lifetime commitment has been made does not mean that we lounge around on pillows eating bon bons while the unicorns dance and fairies plan the wedding. We still have to eat. And that's where Deborah Madison comes in. We are doing our best to keep our meat intake down lately (aside from delicious, gigantic rueben sandwiches while we wait for certain fancy pieces of jewelry to be re-sized), so I've been referencing Vegetarian Cooking for Everyone a lot in the last few weeks. I modified this stew to fit what I had in the house. I only had a pound of parsnips and only one apple, but I did have two cups of cooked chickpeas in the fridge, leftover from a previous soup. If your parsnips are very large they may have a woody core (you'll know, it'll feel tough against the knife). Cut that part out, then proceed, and enjoy. 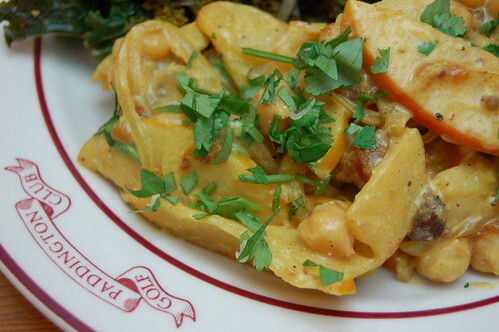 We ate this with some garlicky braised kale, but it would also be great with naan or rice. Steam the parsnips in a steamer basket over simmering water for about 7 minutes until just tender. Heat the butter or oil in a large skillet over medium heat, and saute the apples, onions and curry powder for ten minutes or so until the onions are translucent. Add the parsnips and chickpeas and season with salt and pepper, cook for a few minutes until everything is heated through. 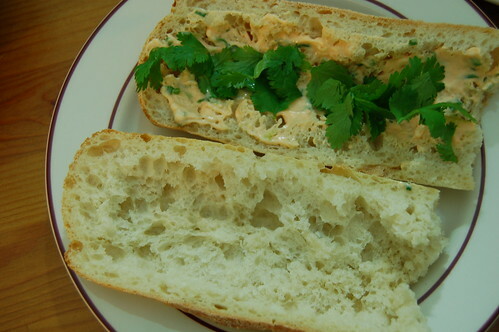 Turn off the heat, then stir in the yogurt, cilantro and chutney, plate, and garnish with more cilantro if you like. This is a very special pine tree. 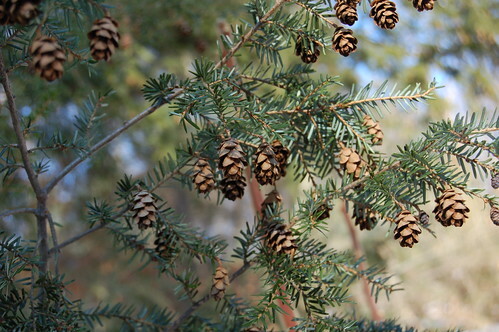 I'm not sure exactly what kind of pine tree it is, but if you're interested, you can take the Orange Line out to the Arnold Arboretum, and take a stroll down the Conifer Path. That's what we did this yesterday, since it was 45 degrees and sunny, a brief thaw from last week's frigid low thirties. We weren't the only couple with the idea; there were plenty of people out and about enjoying the bare trees and sunny skies. I had my camera out, and I stopped to take a picture of some fuzzy sticks that were growing in front of this Very Special Pine Tree. I took this picture, and then right in front of this tree, Adam asked me to be his wife, and I said yes. I mentioned last week on Twitter that I was riffing on a lentil recipe I found over at 101 Cookbooks, and one of my friends responded that she too was cooking with lentils that night. Apparently when it's 20 degrees with howling wind, I'm not the only one who wants to cuddle up with the coziest legume. And cozy is exactly what this dinner turned out to be. It was like a big warm blanket with a mug of tea and a pair of mittens, not exotic or terribly exciting, but snug and warming on a blustery night. 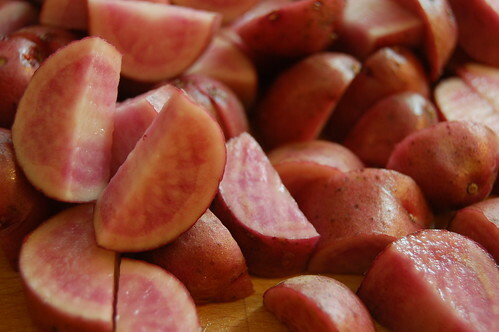 Plus when I cut open the red potatoes I had purchased earlier that week they turned out to be pink all the way through; don't they look like kielbasa sausages? I must have been in the mood for simplicity, because I found that positively delightful. The recipe I adapted this from calls for a sauce of mint and chile in addition to several dollops of yogurt. I had cilantro and parsley in the fridge so I made a sort-of-chimichurri (make sure it's very bright with lemon, or the coziness can become heaviness) and I skipped the yogurt. I roasted the broccoli in the oven while the skillet was full of potatoes because I wanted to cook them at the same time (I was hungry!). You can cook the potatoes, then set them aside and cook the broccoli in the same pan (you will probably need more oil), then add the potatoes back with the rest of the ingredients if you don't want to turn on the oven. But when it's 20 degrees outside, turning on the oven is something I want to do all the time! I used the little blender attachment to my stick blender, but you could use a food processor or blender, just whiz all the ingredients together. 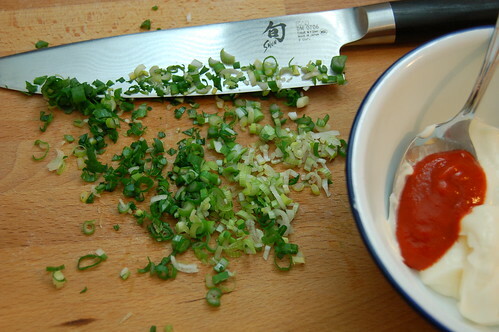 You may need to stop and scrape the sides some, and make sure to taste it and add salt or lemon if needed. Meanwhile, slice the potatoes in halves or quarters. Heat a wide skillet (with a lid) over medium-high heat and add a tablespoon of oil, then add the potatoes and stir. Sprinkle a little salt over the potatoes (1/2 a teaspoon or so), then put the lid on the skillet for a few minutes. Letting the potatoes steam themselves a bit helps them cook through before the outsides burn. Take the lid off and turn the potatoes a couple of times; you're trying to get a good golden brown crust on at least one side but if the outside browns very quickly, turn the heat down. This took me 10-15 minutes, but your mileage may vary. When the potatoes are done (a knife meets no resistance all the way through the potato), add the cooked lentils and a handful of almonds. Toss it all around, season with salt, and add a little splash of olive oil if it looks dry. 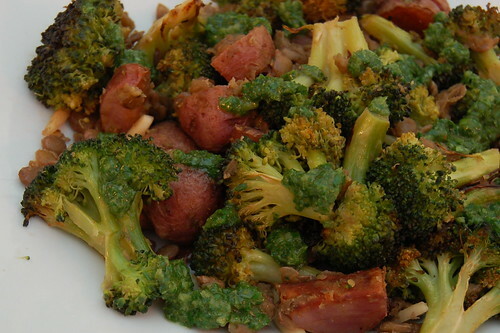 Take the broccoli out of the oven and add it to the skillet. If it's been sitting, give it a little stir and a few minutes to heat back up. When ready to serve, top each plate with several spoonfuls of sauce. 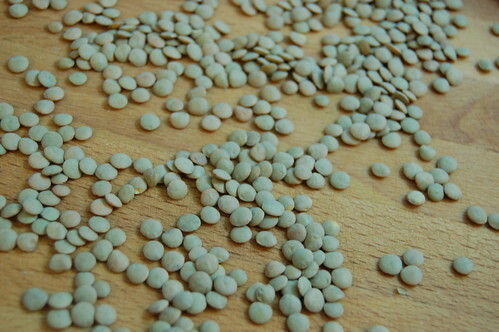 *To cook 1/2 a pound of lentils: sort the lentils to remove any bits of non-lentil material and give them a rinse. Add to a pot with 3-4 cups of water and bring to a boil. Reduce heat to a simmer and cook 30-50 minutes until lentils are tender (the fresher the lentil the shorter the cooking time). Drain. 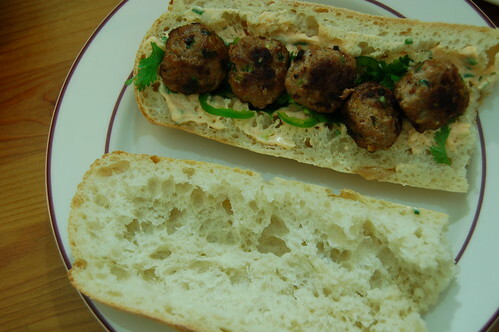 I considered starting this post "so now that we've got healthy and resolved out of the way, let's make meatball sandwiches!" And then I thought better of it, because I don't want you to feel bad about making these, because guys. This is the best sandwich I have ever made. It is hearty and spicy enough to make me sweat just a little (don't run away from that, there's a way to fix it! ), and warm and satisfying. We had these for dinner, then constructed two more minus the pickles (so they wouldn't get soggy), and wrapped them in plastic. At work the next day I added pickles and it was delicious even cold! 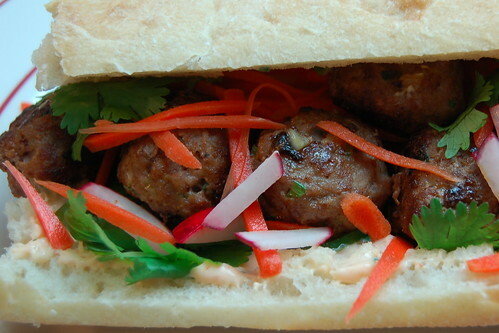 The recipe is from Bon Appetit's January 2010 meatball issue, though I made a few adjustments. Adam generally avoids pork (and other animals in the top 5 intelligent animal category), so I used ground turkey. I also eyeballed the mayo recipe because I didn't know where my 1/3 cup measure was. 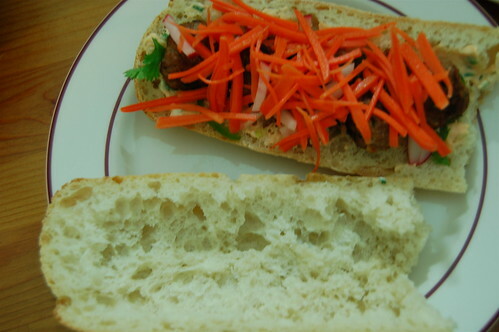 Oh, and I couldn't find daikon so I used some regular red radishes we had in the fridge. I tried coarsely grating the carrots but all I had were baby ones, and I didn't want to smash my knuckles to bits on the grater, so I julienned them. It was a bit of a pain, but I really liked the pickles so it was worth it. Don't forget to hollow out the bread! If you think this is going to be too spicy for you, don't skimp on the mayo, just skip the jalapenos. Combine all ingredients in a small bowl and stir. Easy peasy! Cover and chill. 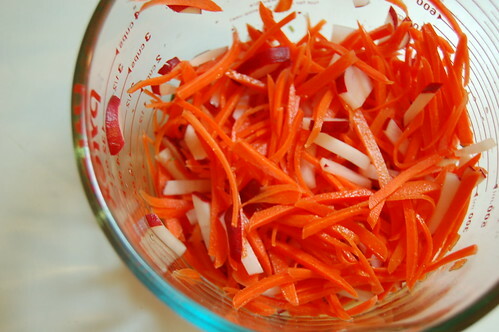 2 cups daikon, julienne (or coarsely grated) - I used regular red radishes because I couldn't find daikon. they were a pain to cut but they worked just fine. Combine all ingredients in a bowl and let stand at room temperature for about an hour, giving it a stir if you think of it a couple of times. First, combine the pickle ingredients and set them aside at room temp. 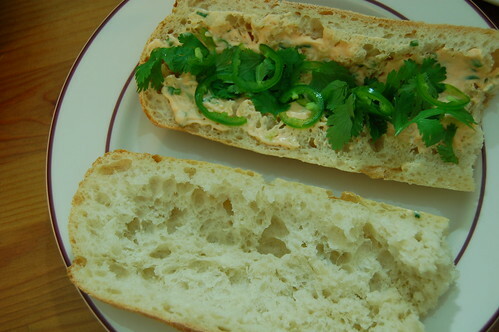 Then combine the spicy mayo ingredients and stick that in the fridge. Ok, great, now let's make meatballs! Line a large rimmed baking sheet with plastic. In a large bowl, gently combine all the meatball ingredients. Gently! Compact meatballs are dense and heavy and icky. We don't want that. If you have time, chill the meat mixture for 30 minutes to make it easier to form into balls. If not, press on. Set out a little bowl of water, and moisten your fingers. 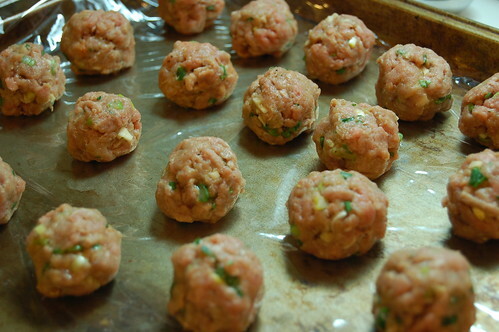 Use a tablespoon measure to scoop up scant tablespoons of meat and gently roll them into 1 inch meatballs. It's more of a press than a roll, really, but gentle is key. Line them up on the plastic-lined baking sheet until you run out of meat. I got about 30 meatballs out of the mixture. Heat a tablespoon or so of grapeseed oil plus a couple of dashes of sesame oil in a large pan over medium high heat. Saute the meatballs in two batches until browned all over and cooked through, turning frequently with tongs. Transfer to a paper towel lined plate to drain, or if necessary a 300 degree oven to keep warm. 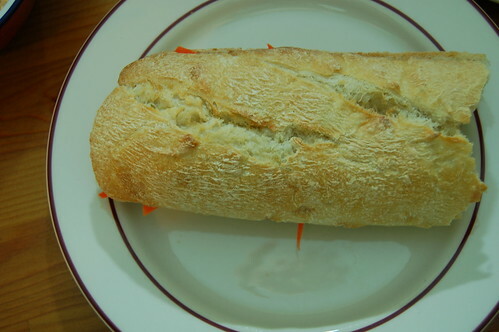 Now to construct the sandwich: hollow out a length of baguette to create a little bread boat for your fillings. 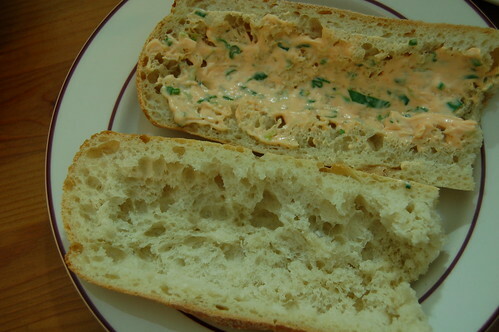 Slap a thin layer of hot chili mayo over each side of the bread. In one shell, place cilantro and jalapenos, then 1/4 of the meatballs, then a pile of pickles (drain them first). 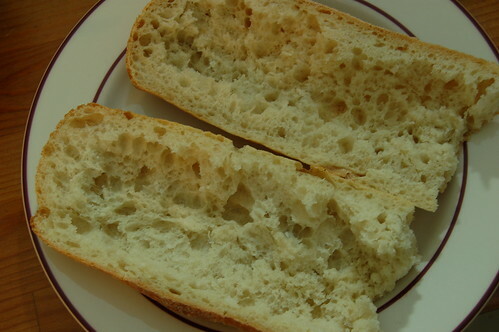 Top with the other bread shell. I've always thought it's a little weird, resolving to eat better and get healthy right as we enter the deepest part of winter. There are so few really fresh vegetables available in January (and February and March, here in Boston anyway), and it seems clear to me that eating more fruit and vegetables and less crap is one of the easiest (and tastiest) ways to get healthy. 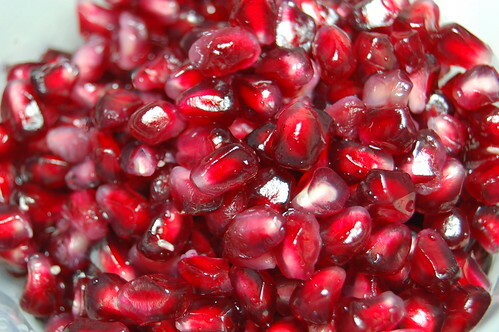 And with that, I bring you the pomegranate. I'm sure you've seen it before (at least in a bottle); it's a weird little fruit. You eat the seeds which fill the inside, not the nasty white pith that holds them. And they're blood red, and they stain. Oh, and they're a superfood, with higher levels of antioxidants than tea or red wine! 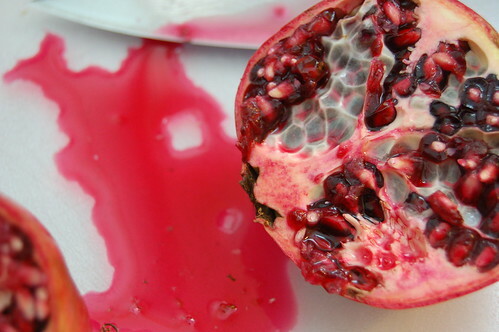 But how do you eat the pomegranate seeds once you have them? You can toss them on a salad, or in cous cous or rice pilaf, use them to garnish a cocktail, or, like me, you can top your yogurt + granola breakfast with the little gems. 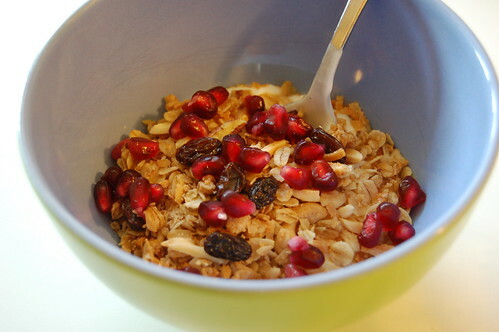 Combine the oats, nuts, coconut, and brown sugar (do this in a large bowl so you can toss it all around. Combine maple syrup, oil, and salt in a measuring cup and add to oat-nut mixture, tossing to distribute syrup evenly. Spread mixture out on a large sheet pan (or two). Bake at 250 for an hour and 15 minutes, stirring every 15-20 minutes so it browns evenly. Remove from oven, let cool slightly, then stir in raisins.